Baranec ("lamb mountain", "Baraniec" in Polish) is a 2185m mountain of the Western Tatras, amongst the tallests, and lying entierely in Slovakia. It has links 3 ridges, going south to Goły Wierch and Mały Baraniec, and on the north to Ostrý Roháč and Volovec (Wołowiec), the main ridge. It separates also 3 valleys, the Dolina Jamnická, Žiarska, and Trnovska. The peak is made of granitic, but most of its surface is grassy over the pine-level, and presents a large round-shaped ridge undulating slowly as we go. As we get near the top, the peak overlooks 1000m deep gaps on the east and on the west. Baranec is one of the less frequented places in the Tatras, and in some days you may meet no one during the whole traverse from Pribylina to Placlivé. Also a good place to meet the Chamois of the Tatras. Despite its lack of caracteristic features (rocks, sharp ridges), this mountain is the perfect for the hiker looking for quietness. - From Slovakia, take the road via Dolný Kubín and Liptovsky Mikulas. - From Poland, very long way... thake the border point at Chyżne (or, from Silesia, Korbielow or Rajcza/Novot) and circumvent the Tatras. By public transports, These 2 valleys are reachable by bus from Liptovsky Mikulas. The hiker must know that offtrails in Slovakia is tolerated only for mountain-climbing when accompanied by a registered mountain guide, or holding a licence of UIAA club (Not all zones, Natura 2000 zones are strictly forbidden, but there are none around Baranec). However, Baranec is served by many very convenient official trails so that offtrails is not really required, and I discourage one to try, it would be a very stupid way to get fined. There are 3 ways to visit Baranec making a loop. All of them are from the Slovak side. Of course it is possible to imagine more "exotic" circuits, possibly from Poland since 2008 (thanks Schengen), but in this case see the Volovec routes. This circuit visits Baranec and its 2 southern ridges, that end respectively in Pribylina and Žiar, and linked via the red trail of the Tatranská Magistrála. The west ridge (yellow) goes via Holy Vrch and the east one (green) via Maly Baranec. The loop can be done in both directions, but always prefer starting with the peak and the portion of Tatranská Magistrála in second (to reduce the chances being caught in a storm). Start in Žiar by the ascent of Baranec via Holy Vrch (yellow trail), and continue north from the top until the pass Žiarské Sedlo. Return is made by the descent in the valley Žiarska Dolina. The circuit is best-made in this direction (storms), unless you plan to sleep at Žiarska Chata the evening before. Start from Pribylina campsite by the ascent of Baranec via Maly Baranec (green trail), and continue north from the top until the pass Žiarské Sedlo. Return is made by the descent in the valley Račková. The circuit is best-made in this direction (storms), unless you plan to sleep at Koliba pod Pustým the evening before. 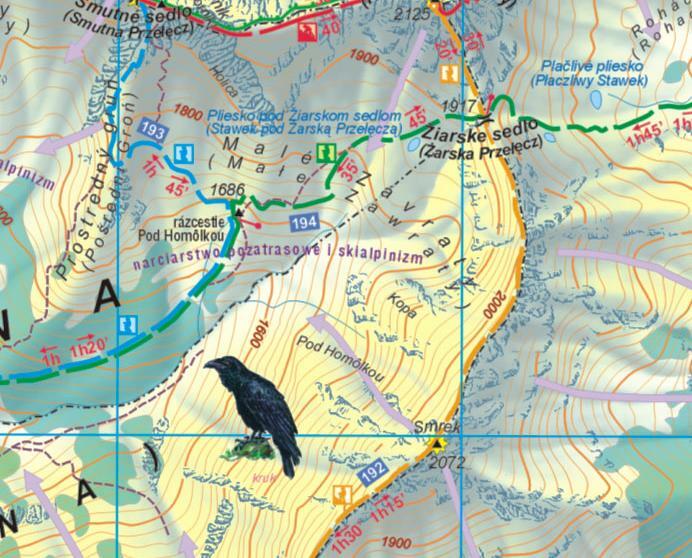 Wild-camping is strictly forbidden in both National parks TPN (Poland) and TANAP (Slovakia). However there is a very good campsite in Pribylina, just at the entrance of the valleys Račková and Jamnická Dolina. There is one official refuge whose location is very convenient for Baranec: Žiarska Chata (http://www.dolinky.szm.sk/chata.htm), Žiarska Dolina (near Žiar). This is a very beautiful newly-rebuilt hut, in a very nice location, with very little frequentation. It's possible to cycle until this place (but no bicycle rental..). - You share the space tolerantly with other people who might want to share this space with you. - If some people who look like officials of the Tatras or forestry managers come to tell you not to use it, obey (they have the right to decide whether these huts can be used or not since they depend on the localities in the village belows). - Koliba pod Pustým, which was recently introduced in an SP hut page by Rama. Further description on its page on Hiking.SK. It is located on the blue trail in Jamnická Dolina roughly at the same level horizontally than the top of Baranec. - Another very good hut, but not in the neighbourhood of Baranec (rather good for climbing Klin (Starorobocianski Wierch in polish), or Jakubina, is Koliba pod Klinom, located in the upper part of the Račková Dolina, at the junction of the yellow and green.